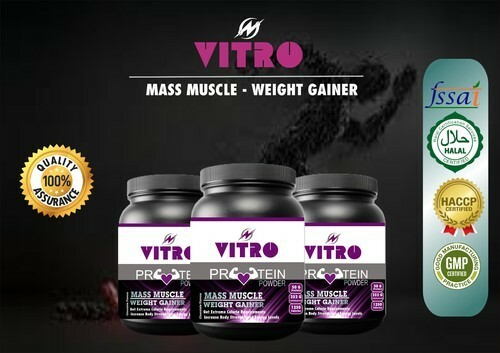 VITRO Mass Muscle Weight Gainer are high-calories supplements that contains 50gm of protein, 4.5gm fat, 252 gm carbohydrates, Essential minerals and vitamins, amino acids and various other supplements. The amount of protein in Mass Gainer may be less than taht of Whey protein but the level of carbohydrats and fats is certainly on higher side. This high carb amount is necessary to boost the calories intake. So, though a VITRO Mass Gainer may act as a source of Protein, but it should be taken by people who are hard gainers. They are the ones who do not gain weight as easily as an average person would after eating a sumptuously balanced diet. So, in combination with the everyday food intake, skinny oor thin people can opt for VITRO Mass Gainers if they want to build a significant amount of muscle mass. So, the high amount of calories one will get from a VITRO Mass Gainer will help that person bulk-up. A VITRO Mass Gainer can be taken belded with water or milk before or after a workout as required or directed by a health expert. AGNUS PHARMACEUTICALS, the re-known manufacturer, suppliers and exporters in India. We provide a wide range of products – Antibiotic, Antifungal, NSAIDs, Gastrointestinal, Nutraceuticals, Therapeutics and Cosmetic, Dermal and several other categories – across the nation. Our Total Quality Management system adheres to GMP regulation and we endeavor to achieve and present the best quality standards in the industry. Our unique assets and skills are always oriented towards developing novel and differentiating scientific solutions through innovative products designed to improve the quality of life.